It’s hard enough to earn points in the notoriously deep Hockey East conference when only one opponent is scheduled for the weekend, let alone two different matchups on back-to-back nights. 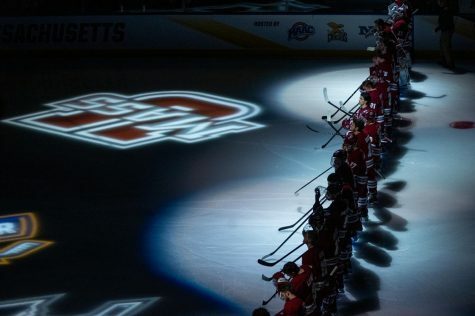 But that’s exactly the gauntlet the Massachusetts hockey team will face this Friday and Saturday night, when they take on conference foes Northeastern and UMass Lowell. Minutemen coach John Micheletto elaborated. 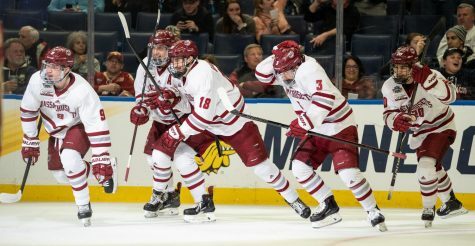 UMass (8-17-1, 3-12-1 Hockey East) got off to a rocky start this season, but have been playing their best hockey of the season at the right time. 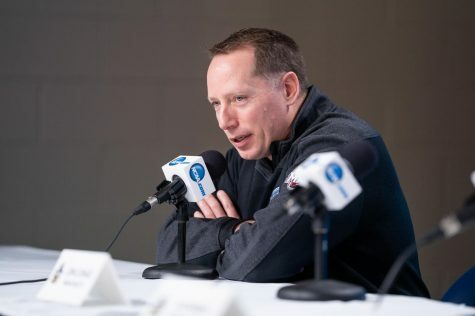 A mark of 4-5-1 since returning from its shortened winter break has restored some energy to the program after a first half marred with embarrassing defeats. Perhaps not coincidentally, the improvement to a near .500 team has gone hand in hand with the arrival of freshman defenseman and Anaheim Ducks second round draft pick Brandon Montour. He has put up 12 points in just 11 appearances so far this season. 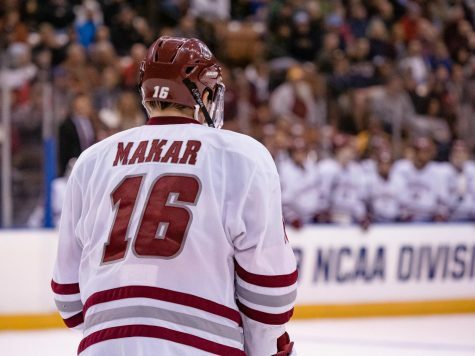 On Friday, UMass has a chance to win the season series against Northeastern (11-11-4, 6-7-2 HEA) after the teams split the first two games of the year. 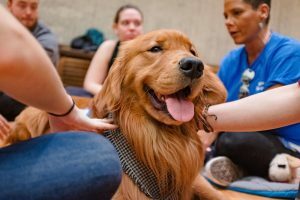 However the Minutemen are the only team to come away with Hockey East points out of the series so far, as the Huskies win came in an independently scheduled, non-conference matchup. 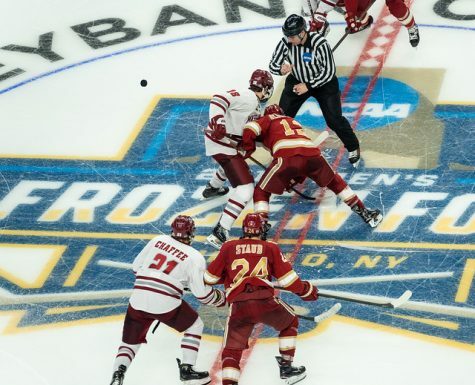 Northeastern – coming off an upset of five-time defending champion Boston College in the first round of the Beanpot Tuesday night – will have to face UMass before advancing to the championship game against Boston University. The Huskies are led by junior forward Kevin Roy, who leads the team in points with 28 points in 25 appearances. 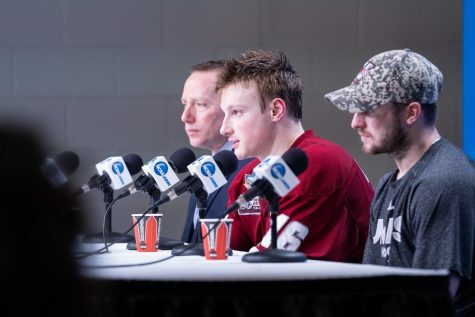 Last time out against the Minutemen, Roy scored twice and added three assists for a five-point night to fuel Northeastern to an 8-3 blowout win. 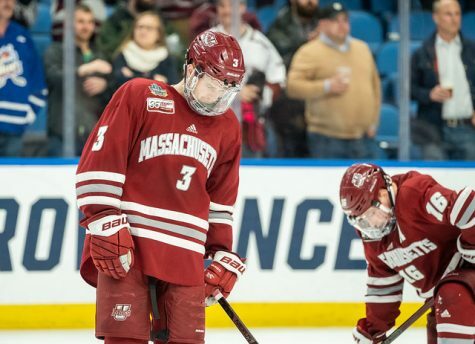 The Huskies scored five power play goals in the first matchup making the penalty killing a top priority for UMass if it hopes to avoid a similar disaster. In net, a tandem of redshirt junior Clay Witt and redshirt sophomore Derick Roy—Kevin’s brother – have split time almost evenly for Northeastern, and the pair have an identical save percentage of .910. 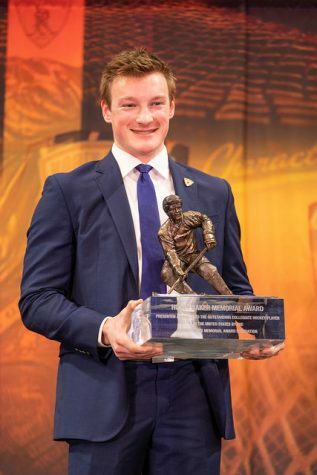 The Huskies are also playing their best hockey of the year at the most important time. They’ve only lost once in their last 12 games, and hold an 8-1-3 record in that period. 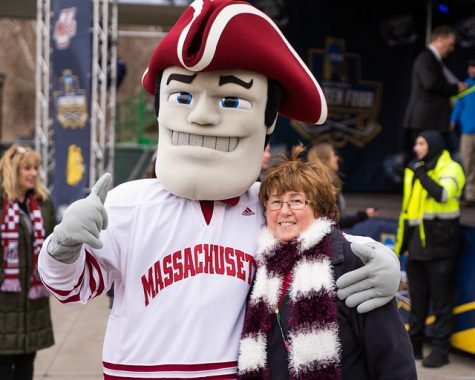 Saturday night, the Minutemen turn their attention to rival No. 12 UMass Lowell. In an odd scheduling quirk, it’s the first of three games in a row against the River Hawks (16-8-3, 9-5-2 HEA), although the middle game is another non-conference affair. It’s also the first game of the season between the two UMass teams, after Lowell swept the season series 3-0 in 2013-14. Junior Kevin Boyle has been a rock in net for the River Hawks, starting 21-of -7 games for UML and posting a record of 13-5-3 and save percentage of .917. Offensively, freshman C.J. Smith is first on the team in scoring with 12 goals and 12 assists, and sophomore defensemen Michael Kapla leads the team in assists (14) and plus/minus rating (+16). Puck drop is set for 7 p.m. both nights at Mullins Center. 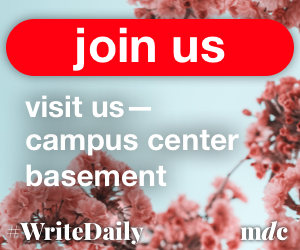 Ross Gienieczko can be reached at [email protected], and can be followed on Twitter @RossGien.